Filtrexx® filter soxx are used for the perimeter control of sediment and other soluble pollutants around construction and mining sites. Filter soxx used for sediment control can be installed downslope from any disturbed area and are most effective when installed perpendicular to sheet or low concentrated flow. Around sensitive trees where trenching may damage existing roots and vegetation. Install sediment control soxx parallel to the base of the slope or disturbed area. In extreme conditions (ie 2 in 1 slopes), a second sediment control soxx should be located at the top of the slope. Stakes should be installed on the low side of the soxx at 3 metre intervals. If the sediment control soxx is to be left as a permanent filter or part of the natural landscape, the soxx may be seeded at the time of installation for the establishment of permanent vegetation. Routine inspection should be conducted within 24 hours of a runoff event or as designated by the regulatory authority. 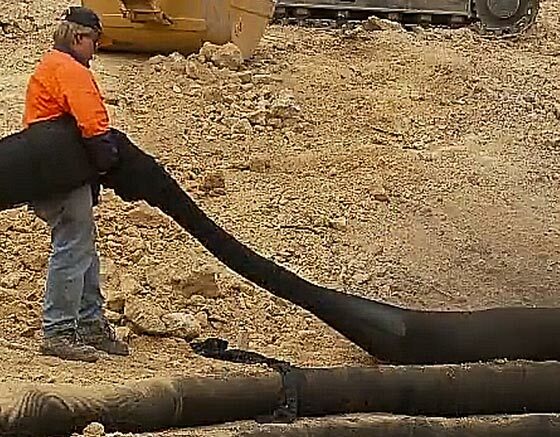 Sediment control soxx should be regularly inspected to make sure that they maintain their shape and that they are producing adequate hydraulic flow through. If ponding becomes excessive, additional sediment control may be required to reduce effective slope length, or sediment removal may be necessary. Filtrexx® filter soxx can be installed in combination with geotextile matting and compost blankets to control the sheet water velocity and direction. All erosion control and stormwater management projects. For erosion control, sediment control, silt control solutions and services Integrated Group is the #1 company in Australia. © Copyright 2019 Integrated Erosion Control Australia. All rights reserved.